Beginning Nov. 8, 2015, you can enjoy Character dining all day long at Garden Grill Restaurant at Walt Disney World® Resort. Served family style and all-you-care-to-enjoy, the menus for breakfast, lunch and dinner are inspired by the garden-grown theme of The Land at Epcot®. And while you dine, you can meet popular Disney pals, including Mickey Mouse, Pluto, Chip and Dale, as they revolve around vibrant views from the Living with the Land attraction. (Characters are subject to change). For breakfast, served from 8-10:30 a.m., you can enjoy favorites like biscuits and gravy, scrambled eggs, crispy bacon, Mickey waffles and the restaurant’s signature item, Chip’s Sticky Bun Bake. And at lunch, served from 11:30 a.m.-3 p.m., you can feast on all-you-care-to-enjoy favorites from the dinner menu, including “Living with the Land” Harvest-inspired Farmer’s Salad, char-grilled sliced filet of beef, roasted all-natural sliced turkey breast with freshly-harvested vegetables and scrumptious side dishes. 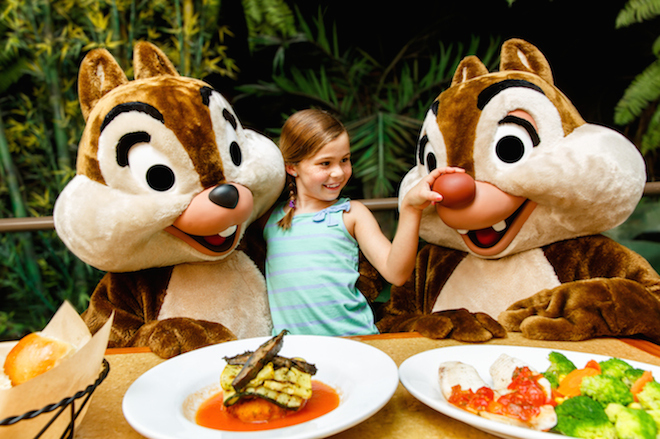 Chip ‘n’ Dale’s Harvest Feast will continue to be available for dinner from 4-8 p.m. daily. All meals at Garden Grill require one table-service entitlement on the Disney Dining Plan. Meeting the characters at Garden Grill is always fun, but don’t take my word for it. 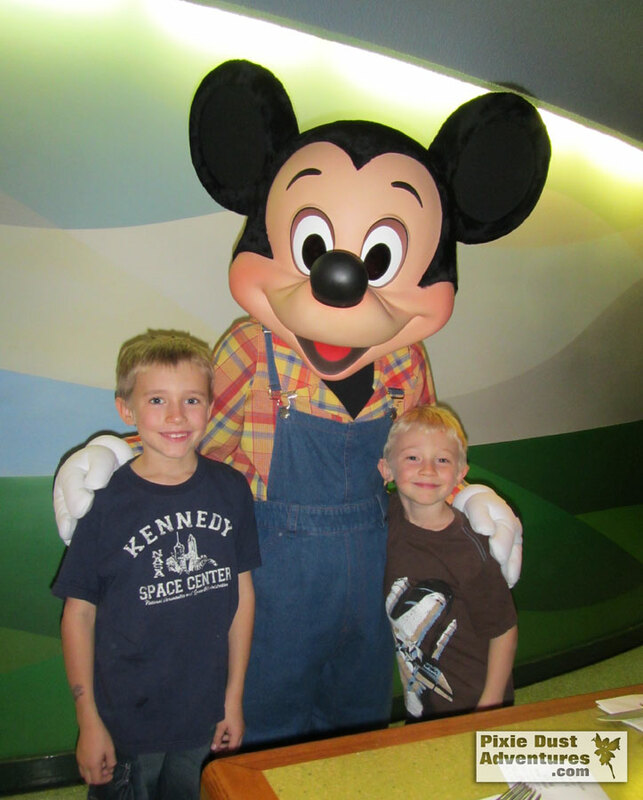 Look at the smiles on the faces of my children when they meet farmer Mickey. It looks like the testing period for the Be Our Guest Lunch Fastpasses will soon be coming to an end. Currently, Disney Resort Guests can log on to https://beourguestlunch.disney.go.com/ and make fastpass lunch reservations up to 28 days prior to their arrival date. If there is availability for fastpasses, guests are able to select a time window, in which to show up & be seated and food can be ordered ahead online for faster service or selected when you arrive. This does not currently take away from the allotment of 3 attraction fastpasses for the day. 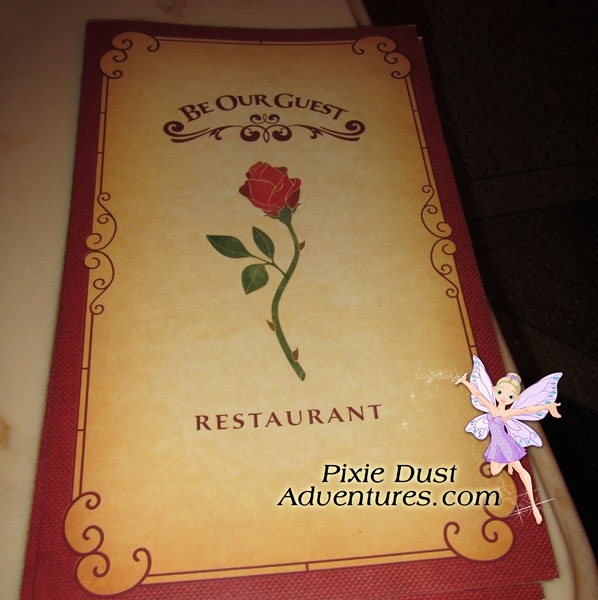 Be Our Guest no longer has any walk up seating available; you currently are required to have either the fastpass for lunch or a dining reservation for dinner. 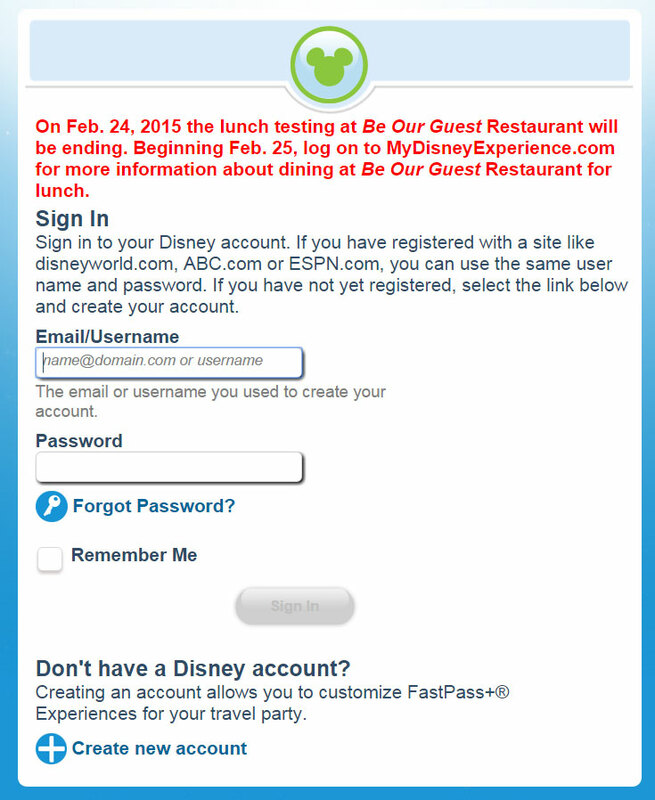 Recently there has been a message, on Be Our Guest’s lunch fastpass site, telling people that beginning on February 25th you will need to log on to your My Disney Experience account for more information on lunch fastpasses for Be Our Guest. What they have in store a person can only guess. Will Be Our Guest lunch become part of the regular dining reservations or will it become part of your fastpass allotment? Which would you prefer? Current message on the Be Our Guest lunch fastpass site. 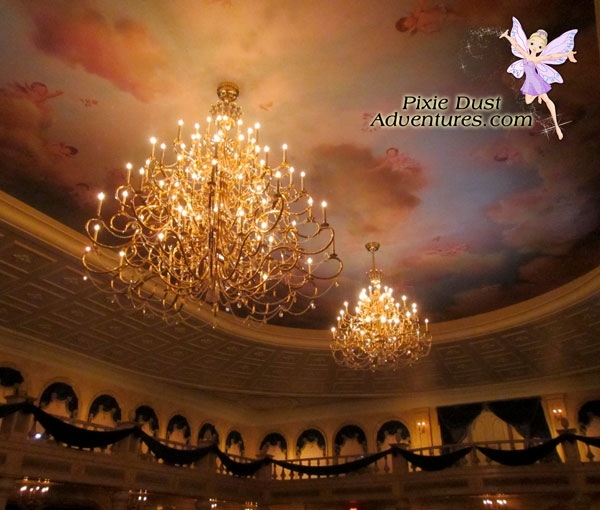 Beautiful chandelier in the main dining room of the Be Our Guest Restaurant.